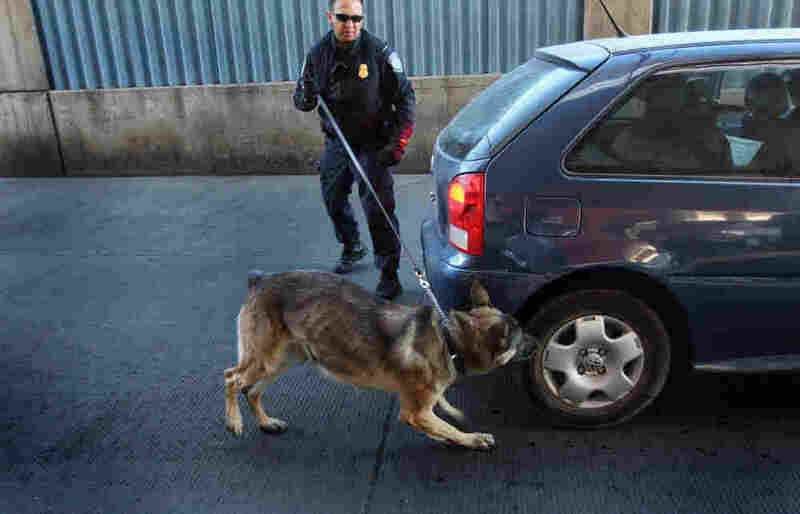 Report: Drug-Sniffing Dogs Are Wrong More Often Than Right : The Two-Way Most detector-dog experts agree that the problems come not from the dogs, but from their handlers. U.S. Border Patrol officer Michael Avelar and drug-sniffing German Shepherd Ali inspect a vehicle. The Chicago Tribune sifted through three years worth of cases in which law enforcement used dogs to sniff out drugs in cars in suburban Chicago. According to the analysis, officers found drugs or paraphernalia in only 44 percent of cases in which the dogs had alerted them. Dog-handling officers and trainers argue the canine teams' accuracy shouldn't be measured in the number of alerts that turn up drugs. They said the scent of drugs or paraphernalia can linger in a car after drugs are used or sold, and the dogs' noses are so sensitive they can pick up residue from drugs that can no longer be found in a car. Dog handlers can accidentally cue alerts from their dogs by leading them too slowly or too many times around a vehicle, said Lawrence Myers, an Auburn University professor who studies detector dogs. Myers pointed to the "Clever Hans" phenomenon in the early 1900s, named after a horse whose owner claimed the animal could read and do math before a psychologist determined the horse was actually responding to his master's unwitting cues. Training is the key to eliminating accidental cues and false alerts, said Paul Waggoner of Auburn's detector-dog research program. "Is there a potential for handlers to cue these dogs to alert?" he asked. "The answer is a big, resounding yes." That might explain the 27 percent accuracy rate the Tribune found when cops stopped Hispanics. Latino activists quoted by paper said this was yet another indicator of racial profiling.